Pilaf is a delicious dish in which the rice is stirred through with onions as well as a mix of aromatic spices. This version, which contains sweet, meaty prawns couldn't be easier to make. •	Heat the oil in a deep pan; add the ginger, green chilli-garlic paste, and cumin powder; sauté until the water evaporates. Add the tomatoes and sauté until they soften and darken in colour; add the yoghurt. Stir to mix well and continue to cook until the yoghurt is absorbed and the oil rises to the surface. Add the coconut and then a few seconds later add the coconut milk and sail. Stir to mix well and continue to cook until the gravy thickens. Add the prawns and bring to the boil. Turn off the heat. Pour the prawns with the sauce into an ovenproof pan. Keep aside. Bring 5-6 cups of water to a rapid boil. Add the cloves, cinnamon sticks, green cardamoms, and salt, Add the rice and boil for 6-7 minutes. 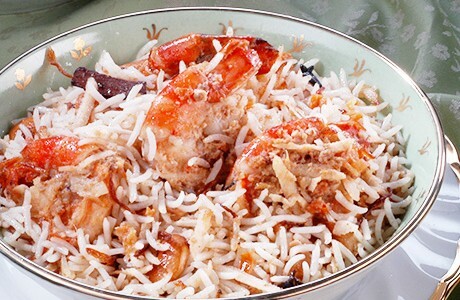 Drain the rice and spread it on top of the prawns. Spread the cashew nuts and fried onions. Make a few wells in the rice all the way to the bottom to allow the steam to escape. Cover the pan with an aluminium foil and then with a tight-fitting lid. put the pan in a preheated oven (170°C / 325°F) for 15 minutes. Mix before serving.